Rich Ride is the most Nektan casino that there has ever been, and when you consider the outrageous number of Nektan casinos that there are in the world, that’s really quite a statement. 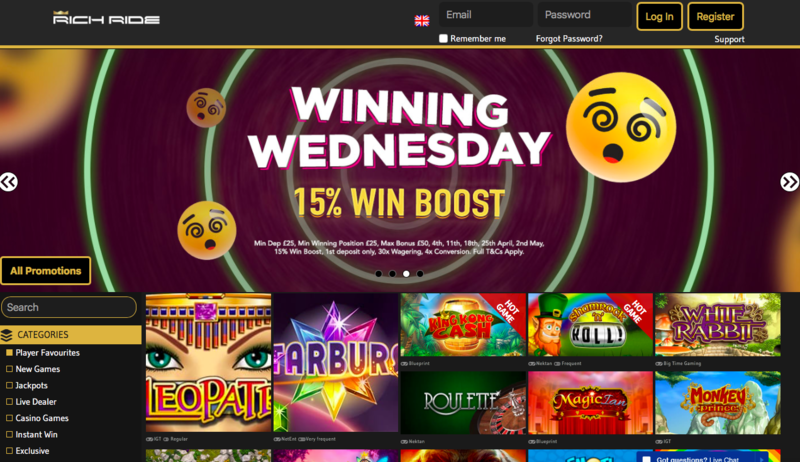 A recent addition to the Nektan portfolio, having been launched in mid-March (2018) Rich Ride joins a network that is full of near identical looking sites to the point that many players are just not interested by Nektan sites any more. This means that if Rich Ride is going to be seen as anything but another soldier in the ever-growing army of clones that Nektan seems intent to force on the online casino industry, then it has to really stand out, not only from other sites on the network, but from other sites in general. Nektan’s history does not exactly show a strong ability to do this, but we’re always willing to be surprised. Unfortunately, if we are going to be surprised by a Nektan site, it doesn’t seem likely that it’ll be Rich Ride, which feels more generic and derivative than its brethren, which, again, is really quite a statement! Absolute painting-by-numbers, you don’t have to be told this is a Nektan site to immediately know it is, and that is not the kind of brand recognition the operator is likely to be going for. Even for Nektan, the theme of Rich Ride is unoriginal. As the name suggests, affluence is at the heart of everything here, with this site clearly trying to advertise itself as one for the high rollers. 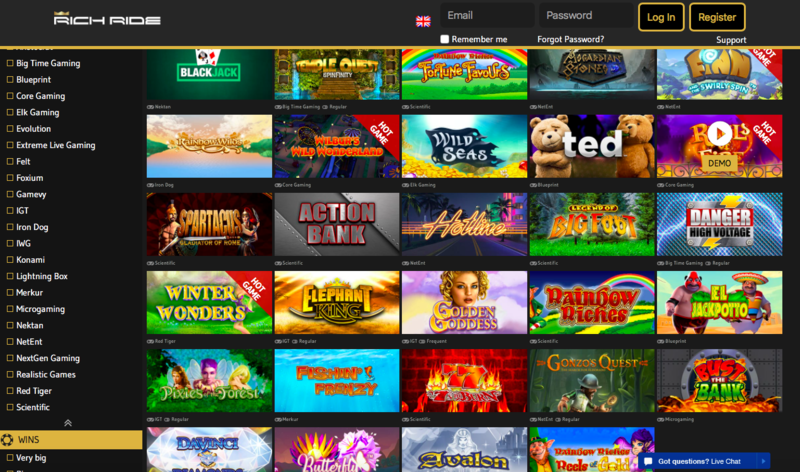 It seems like every single online casino that aims at the big spenders uses a black and gold colour scheme, and if you expected anything different from Rich Ride, you will be disappointed. Golden elevator doors, marble effect walls, and other ‘elegant’ images can be found in the casino imagery in the background, with two awkward looking models standing in front of it, near a casino table and staring at the screen in a way that suggests the photo was taken at the point that they were waiting for the photographer to tell them what to do. Navigation is simple enough, but only because Rich Ride is set up in pretty much exactly the same way that every other Nektan casino is, with even the thumbnails on the homepage being in the same order as they are at other Nektan sites. Even by the low standards set by this network over recent years, Rich Ride is an abysmal looking site. It is here that some positives can be found. To be fair, most Nektan sites have an impressive range of games, but, unsurprisingly, they tend to be more or less the same. Rich Ride bucks that trend a little because, although it does have that same games collection, it also has more. Titles coming from 1X2 Network, Aristocrat Gaming, Big Time Gaming, Blueprint Gaming, Core Gaming, edict egaming, ELK Studios, Evolution, Extreme Live Gaming, Felt, Gamevy, IGT, IWG, Microgaming, Nektan, NetEnt, NextGen Gaming, Realistic Games, SG Digital, and SG Gaming mean that if you can look past the terrible design, and that’s a pretty big ‘if’, then there’s a lot of reasons to like this site. From slots, to table and card games and live dealer titles, and some exclusive (to Nektan at least, basically these are Nektan’s own titles) games, anyone who enjoys online casino play, will be able to find multiple options available at Rich Ride. Is the selection of games enough to make up for the shameful attempt at every other aspect of the site? Maybe, but that’s very much a case of personal preference.